I take these with me if I go out of town. We all know that children need sleep, play and food. If you haven’t properly provided these things for your child, their bad behavior is pretty much guaranteed and you need a time-out. When we think of which foods our kids need, we always think of vegetables because they are important. But the experts will tell you fat and protein are key when feeding a growing child. 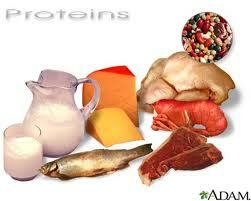 Protein fuels growth and I have found it helps tremendously with mood. My kids are tired of hearing about protein. If they are having a breakdown, I check for what they have eaten first. Our breakfast here usually consists of Thomas’ bagels. They use soy flour to add protein to a toasty breakfast that contains 10 grams of protein. That is more than eggs and toast. If you add milk, you get about 10 more grams of protein and your child is good to go. Protein helps regulate blood sugar. This means it will keep them feeling full longer. A carb-heavy breakfast will vanish too quickly, leaving your child in a blood sugar slump that makes for a cranky kid who is trying to face the most hectic part of their school day.It also helps to balance carbs and protein. Any sugar you allow them will be processed better in a body that has had some protein as well. Below is a chart for protein needs of school-aged children. Protein awareness is helpful with everyone in the family. I have found it helpful to keep my lips together until I put some food in them. Low blood sugar is an ugly thing. Here, we try not to discuss anything we may be upset about during food prep time. It’s amazing how much the moods will change once the food is consumed and the levels are up. Isaac, 9, is so in tune with his bagel/protein intake that he sees the need for protein all around him. Once, after watching Moses kill the Egyptian on Prince of Egypt, he said, “He needs a bagel.” It warmed my blueberry-bagel-loving heart. 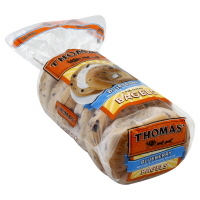 Besides bagels, Thomas’ bagels only by the way, protein is found in meat, fish, rice and beans combos, dairy products, eggs, and legumes. Be aware of how much protein you are offering throughout the day and you will notice the happy level going up as their bellies stay full and their moods improve. This entry was posted in parenting tips and tagged blood sugar levels in children, children need protein, food and mood, how much protein does my child need, protein, protein needs of children by lookmom. Bookmark the permalink. Good to know! I love blueberry bagels but don’t necessarily have a favorite brand, so I usually just pick at random. I’ll go with Thomas’ next time.